The Ei168 RadioLINK Base transmits a radio frequency (RF) alarm signal when the unit attached to it senses fire. need to install long interconnect wires between all the alarms on different floors in different rooms. 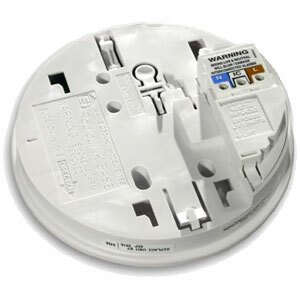 The Ei168 RadioLINK Base is designed for use with the Easi Fit range of mains powered alarms. The Ei168 itself is also mains powered and has rechargeable lithium cells for back-up in the event of mains failure. The Ei168 base will normally be wired to the nearest mains circuit in the ceiling (usually the lighting circuit). a "repeater" i.e. re-transmission of the RF signals. The Ei168 has built in circuitry to aid suppression of voltage transients and RF interference.